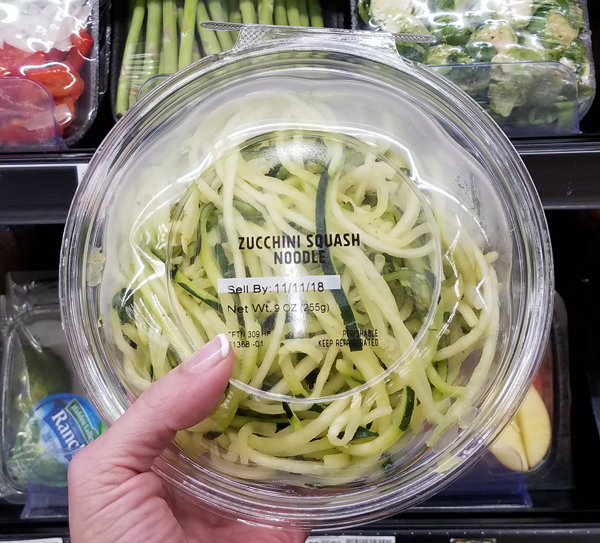 This week I had low carb fast food twice, one restaurant meal, found some great deals at Kroger, and otherwise had a super easy low carb week. Keeping it simple is KEY for me. Although I have to admit I love it when I do meal prep or cook, because it makes “grabbing something out of the fridge” easy and nice on busy days! 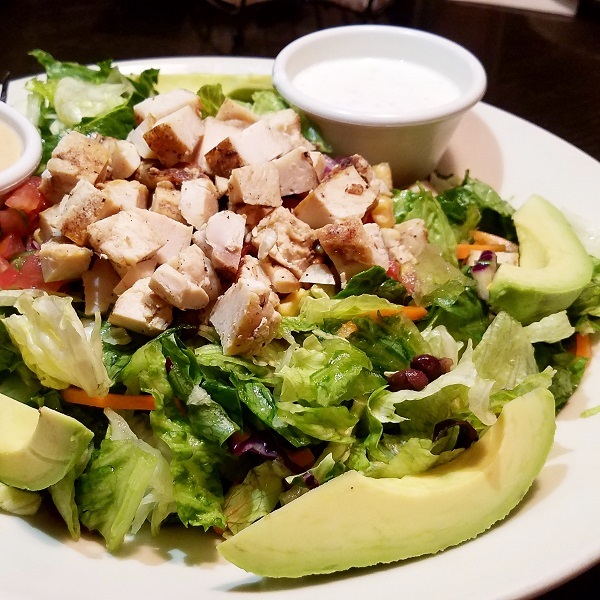 This is more like “it did the trick” than “it hit the spot” but it’s a great grab on the go in a hurry – and a great deal too. 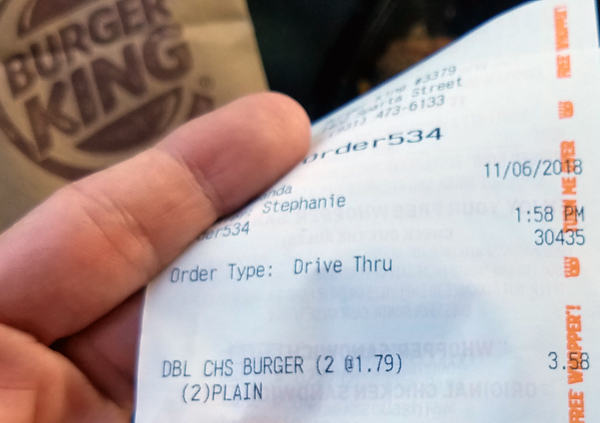 It’s “two double cheeseburgers, both plain, no bun please – just meat and cheese” from Burger King. 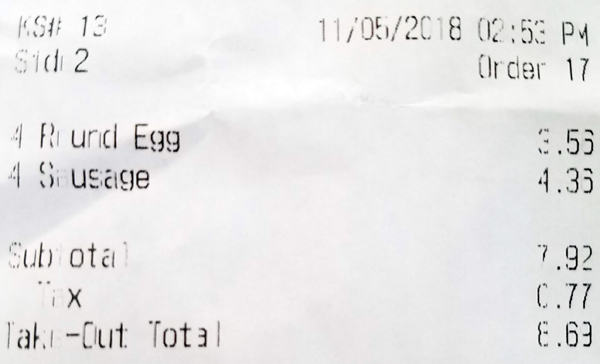 As you can see from my receipt below it’s less than $4 – and it’s actually more filling than it looks like it might be. That makes two meals for me, but it was convenient to eat real quick and have something to eat later while I was out the other day. People always ask me how much that ^ costs. 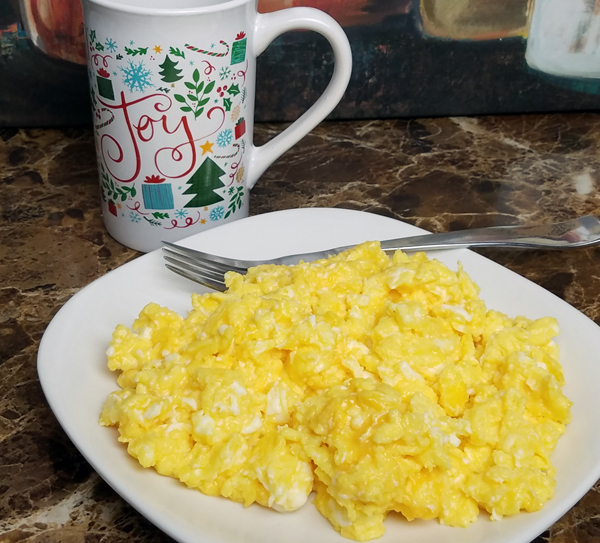 I had my favorite cheesy eggs for at least one meal most days this week, lunch or dinner usually because I’ve been having a keto shake for breakfast lately. I usually scramble 5 eggs in real butter with colby jack cheese cubed off the block. I can only eat about 3 eggs, so I finish the rest later. I had to make a trip to Kroger this week and they had some GREAT deals. The hot shakes have been so convenient for getting straight to work on the cold mornings this week! I just add hot coffee & stir. 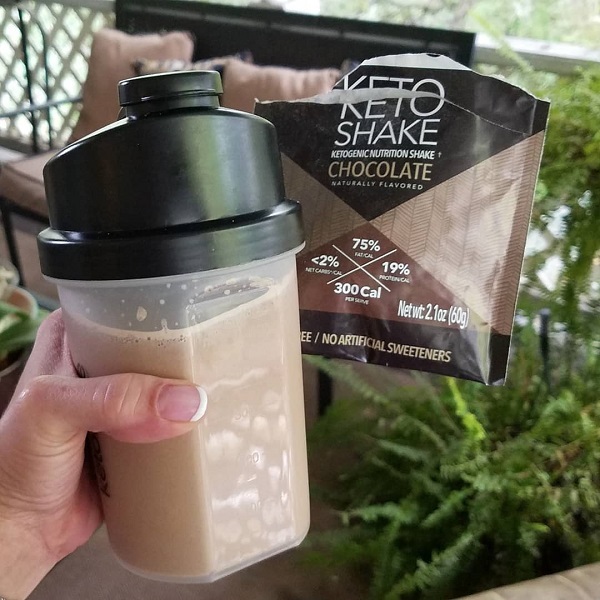 The chocolate & vanilla keto shakes are both great with cold water too, but then you definitely want the tumbler to give them a good shake to mix them up well. They’re thick, rich & creamy – and really hold you over! 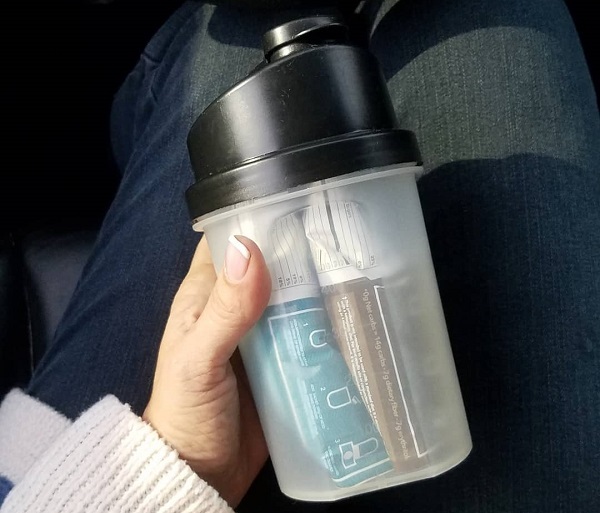 Another thing I love about the tumbler is that I can fit two individual shake packets into the tumbler for easy packing on road trips or just to keep with me on the go. 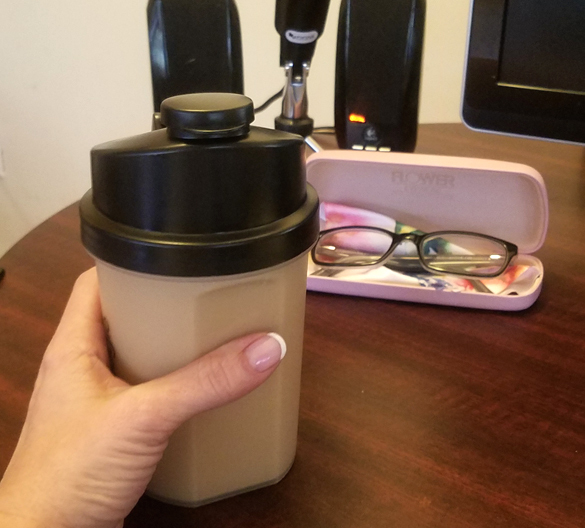 Like I said, these Collagen Keto Shakes make a thick rich shake even with just water – which makes it perfect for a grab & go meal replacement in a hurry. 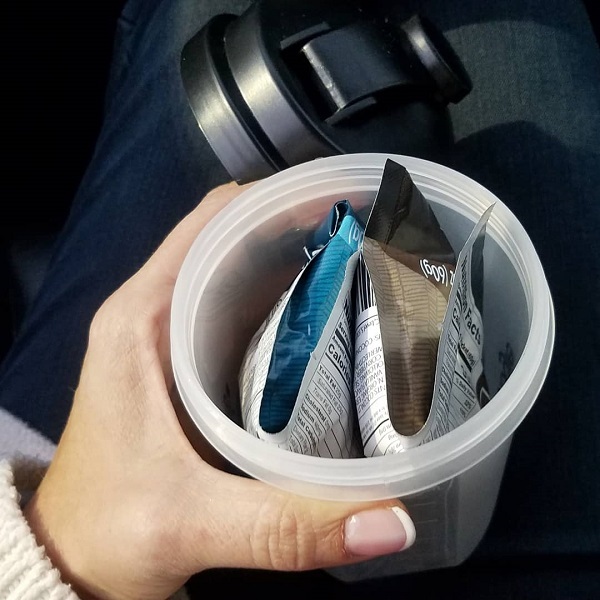 You can get the individual shake packets in two flavors here to “try before you buy” – use my coupon code for a discount too: put in LowCarbTraveler at checkout. 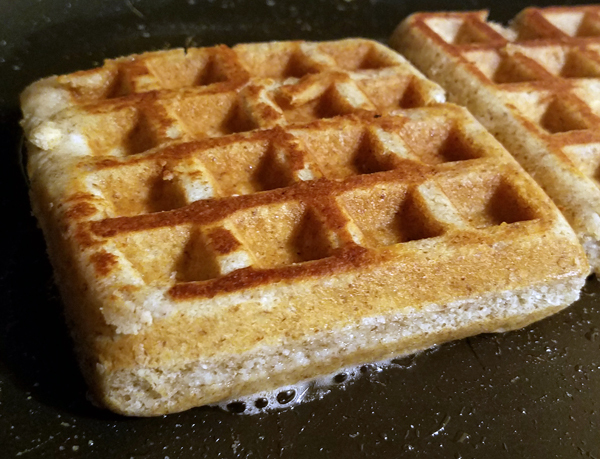 When I got tired of eggs and shakes, I discovered I had some more low carb waffles in my freezer. They’re gluten free, keto friendly, super thick – and just 4 net carbs each. 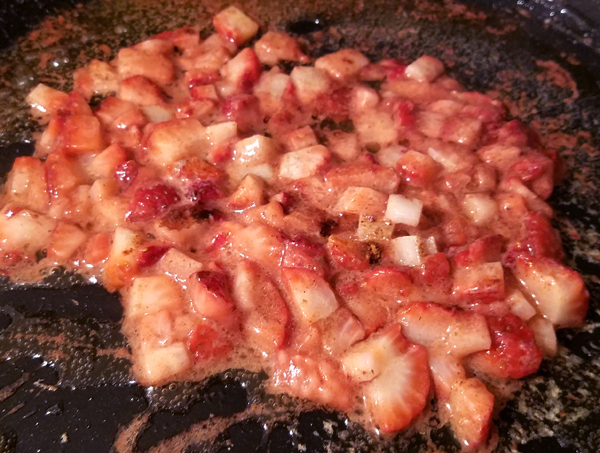 Then I fried the Know Waffles in bacon grease, because… why not?! 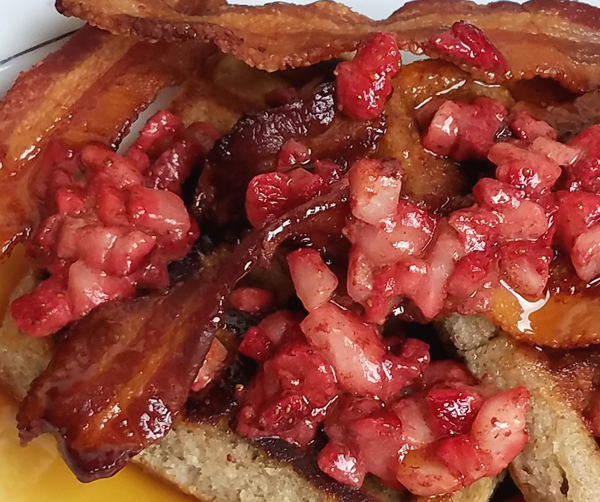 I put the bacon on top of the fried waffles, then poured the strawberries & hot butter over the top of it all. That was entirely too much to eat in one sitting lol. 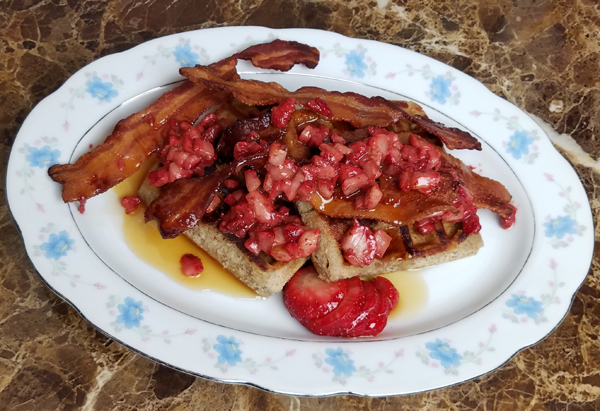 I snacked on the rest of the bacon I cooked, a peanut butter Know Foods Cookie, a pack of peanut butter NUI cookies, had a couple of FBOMB nut butter packets here and there… and basically just whatever I had on hand throughout the week. 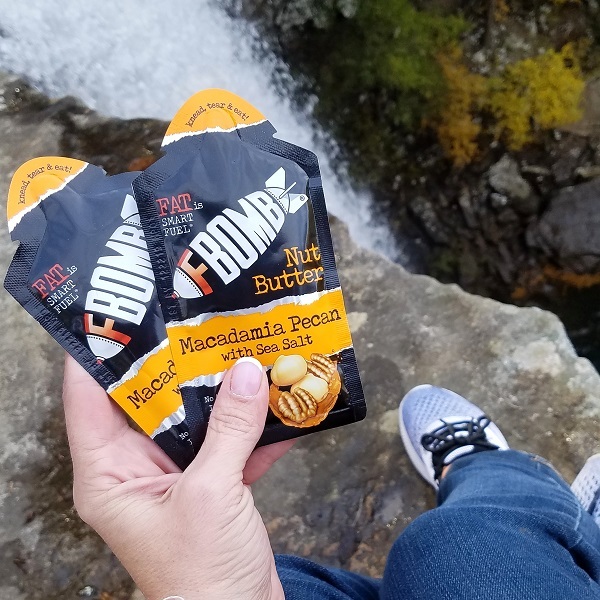 I love the Nut Butter Fat Bomb packets for a quick meal replacement, to power through a long afternoon at work, while I’m hiking or even on road trips. 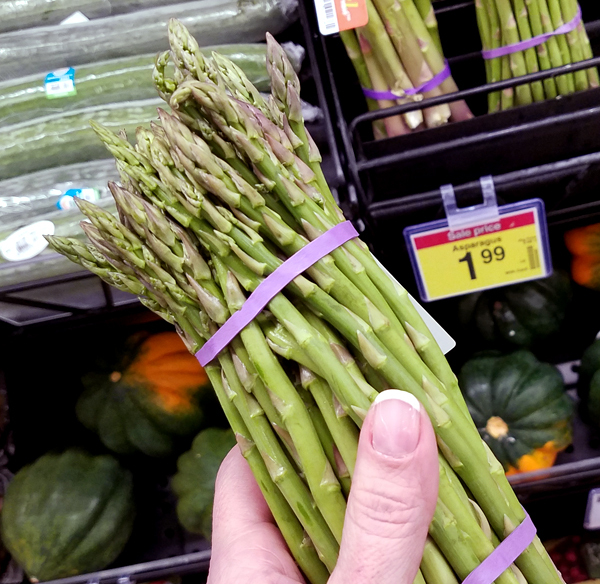 When I did my shopping at Kroger I got some cauliflower rice, asparagus & zucchini noodles so I’m looking forward to a weekend full of delicious low carb veggies. I may go out and get some shrimp to go with that, because a sweet & spicy seared shrimp sounds great with those vegetables! 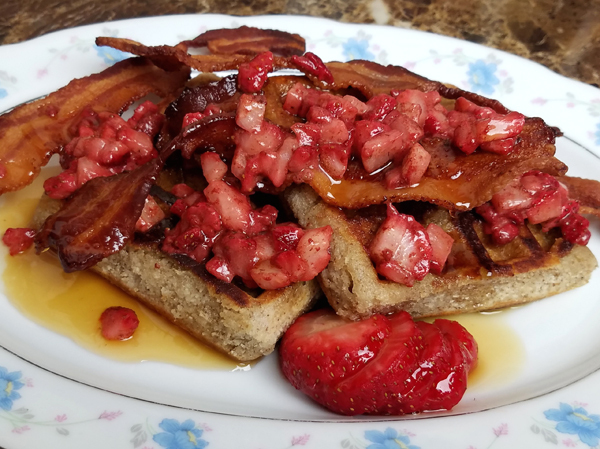 12 Responses to Examples: Easy Low Carb Week – Keeping It Simple! 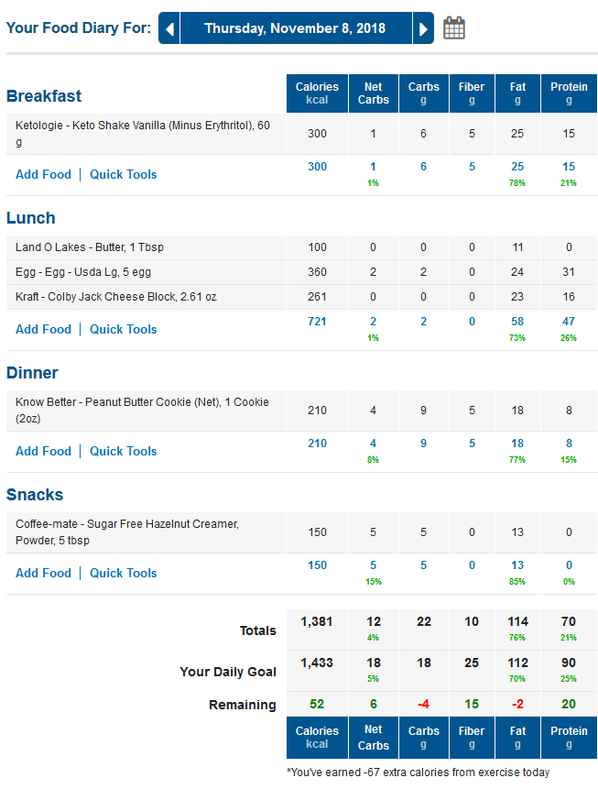 Good meal roundup! 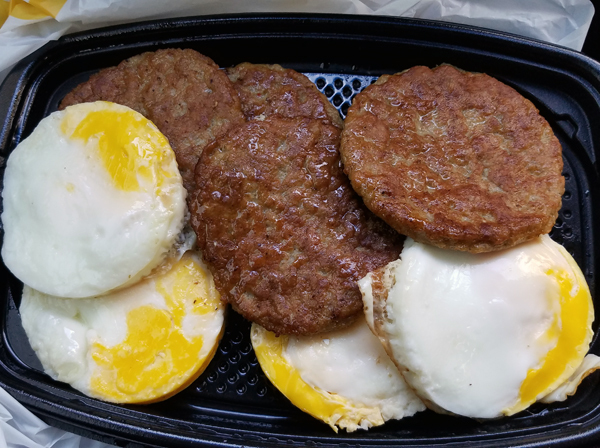 I tried your “round eggs and sausage, please” at McD’s finally and it IS a great easy drive-thru meal when I need one. 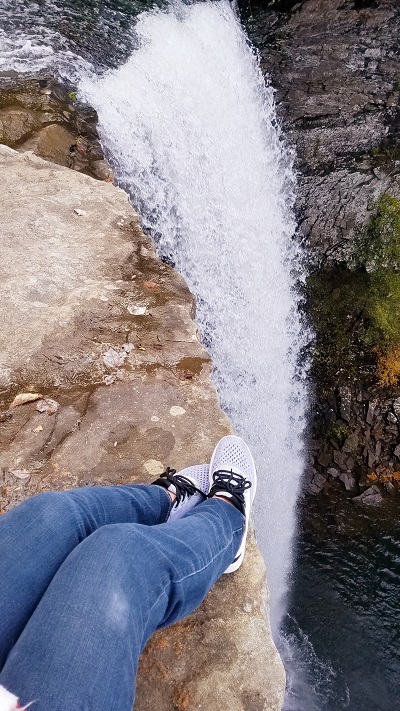 So sorry about that – the coupon code for Ketologie is: LowCarbTraveler 🙂 See: https://www.travelinglowcarb.com/ketoshake for the shake variety pack so you can try both flavors. Glad you enjoyed my favorite McDonald’s meal! The round eggs are cracked on site, and their sausage actually has LESS ingredients than what I buy at the store. I have this every morning in place of coffee. Just use hot water and stir. Vanilla tastes like a latte and chocolate tastes just like hot chocolate. 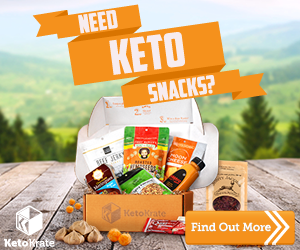 Are you in Ketosis? I ask because that’s a natural appetite suppressant. There are lots of low carb foods you can snack on though! I rarely snack myself… but a nice warm cup of chicken broth in a mug is very soothing in the evening, and I find it kills cravings – even sweet cravings, believe it or not! How can I help? Why do you think you get the munchies late at night? I found an alternative to a grilled cheese sandwich. 1/2 c ground pork rinds, 1/2 c mozzarella cheese and 1 egg. Mix together then divide in half. Put half in a small frying pan and flatten out. Brown on both sides. I loaded with ham, cheese and sliced tomato. Flip it in half and cook a little more. It wasn’t bad. 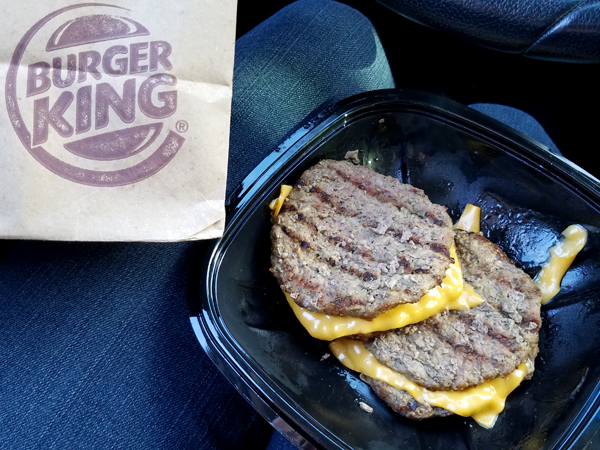 It was like eating a grilled cheese with a crunch. My drink for morning is like a Frappuccino. I don’t see any in the ingredients. Will post to twitter so you can see what it has in it. There also A chocolate drink would be good for mocha.